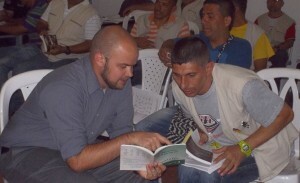 A trainer works with a prospective tutor during a training held at Bellavista prison in Medillin, Colombia, in 2014. Using interactive training, Bridge to Reading teaches volunteers how to offer tutoring in reading, writing, and basic mathematics. Free tutoring takes place in local churches affiliated with the OMS church multiplication network. Churches and training centers that choose to use this training maintain a close relationship with their volunteer tutors. Regional training centers offer further training opportunities for their tutors periodically. 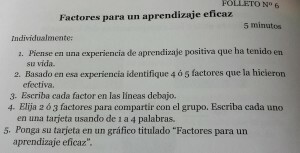 This training is based on ProLiteracy International’s Principles for Effective Training. A core principle of this training is the concept of student-centered instruction rather than teacher-centered instruction. Tutors can influence many students’ lives. That impact is multiplied further for Tutor Trainers. Tutors and trainers help churches, pastors, and ministry groups to meet the need for more tutors. Because of the faithful work of Bridge to Reading tutors and trainers, people will learn to be effective tutors. Their students will learn to read. … the things you have heard me say in the presence of many witnesses entrust to reliable people who will also be qualified to teach others.